Book James Bridle as a keynote speaker. James Bridle is one of the world's most exciting young commentators on the impact of technology on society. An artist and writer working across technologies and disciplines, his artworks and installations have been exhibited in Europe, North and South America, Asia and Australia, and have been viewed by hundreds of thousands of visitors online. For more information on technlogy speaker James Bridle, contact VBQ Speakers founding agent Leo von Bülow-Quirk on leo@vbqspeakers.com or 0044 7833 727090. James Bridle is one of the world's most exciting young commentators on the impact of technology on society. He has been commissioned by organisations including the Victoria & Albert Museum, the Barbican, Artangel, the Oslo Architecture Triennale, the Istanbul Design Biennial, and been honoured by Ars Electronica, the Japan Media Arts Festival, and the Design Museum, London. His writing on literature, culture and networks has appeared in magazines and newspapers including Frieze, Wired, Domus, Cabinet, the Atlantic, the New Statesman, and many others, in print and online, and he has written a regular column for the Observer. 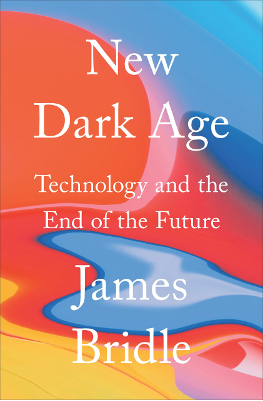 New Dark Age, his book about technology, knowledge, and the end of the future, was published by Verso (UK & US) in 2018. He lectures regularly on radio, at conferences, universities, and other events, including SXSW, Lift, the Global Art Forum, Re:Publica and TED. He was been a resident at Lighthouse, Brighton, the White Building, London, and Eyebeam, New York, and an Adjunct Professor on the Interactive Telecommunications Programme at New York University. A highly original thinker - fusing disciplines from the creative industries to computer science - James brilliantly diagnoses the opportunities and perils humanity faces as digital technology becomes ever more pervasive and powerful. His 2018 TED talk has been viewed nearly 3.5 million times. What’s wrong with the internet today: Writer and artist James Bridle uncovers a dark, strange corner of the internet, where unknown people or groups on YouTube hack the brains of young children in return for advertising revenue.